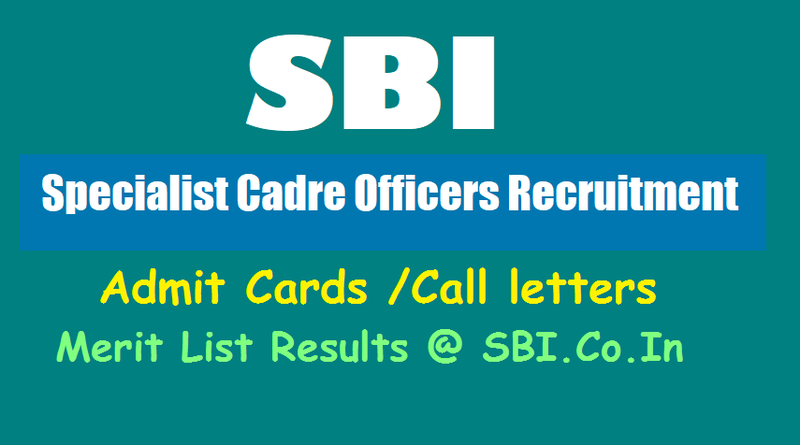 SBI Specialist Cadre Officers exam Admit cards /Call letter: The State Bank Of India (SBI) will issue the admit card for the online written test to recruit specialist cadre officers in the state-run bank tentatively on October 25. The online written test to recruit 50 Deputy Manager (Internal Audit) in the bank is likely to be conducted on 25 February 2018. State Bank of India (SBI) has notified recruitment of Specialist Cadre Officers. Online will begin on 5 January 2018. A total of 50 vacancies are open for recruitment. SBI invites applications from Chartered Accountants with minimum 2 years experience in statutory/internal/ Concurrent Audit of Banks, in/with a Chartered Accountant firm engaged in statutory/internal/ Concurrent Audit of Banks or in employment of a Bank. Applicants must be in the age group of 21-35 years. Details of the recruitment can be found at the official website sbi.co.in. 'Experience Certificate issued by the firms for employees working in CA firms/Copy of the engagement letter from Banks for others, would be required,' clarifies SBI regarding eligibility. Working knowledge in MS office is also required. The job profile includes conducting Audit of branches/ offices of the Bank and/ or its Subsidiaries/ Associates/ JVs located within India or abroad at the direction of the Internal Audit Department of the Bank, preparation of reports for the activities audited containing the findings of audit, preparation of memorandum/reports for reporting to Management and/ or Board Level Committee and any other work that may be entrusted by the Bank. COMMENTSThe selection of candidates will be on the basis of online written test and interview/group discussion; the test will be conducted tentatively on 25 February 2018. The state-run bank will also release a ‘acquaint yourself’ booklet for the exam, which should be downloaded. No intimation/ call letter will be sent in hard copy. After downloading the admit card, candidates must note their roll number, registration number, date, time and venue for the exam. They should reach the exam hall in time. The candidates must bring one photo identity proof such as Passport / Aadhar / PAN Card / Driving Licence / Voter’s Card / bank passbook with duly attested photograph by the branch manager / Identity Card issued by college or institution/gazetted officer in the official letter head, in original as well as a self attested photocopy thereof. The photocopy of Identity proof should be submitted along with call letter to the invigilators in the examination hall. The test may be held at Ahmedabad, Vadodara, Bangalore, Bhopal, Raipur, Bhubaneshwar, Chandigarh, Jammu, Srinagar, Chennai, Madurai, Guwahati, Hyderabad / Secunderabad, Vishakhapatnam, Kolkata / Greater Kolkata, Lucknow, Varanasi, Mumbai / Greater Mumbai / Thane / Navi Mumbai, Nagpur, Pune, Dehradun, Jaipur, New Delhi/ Delhi NCR, Patna, Ranchi, Ernakulam & Trivandrum centres. Out of the 50 vacancies advertised 40 are for Deputy Manager (Internal Audit), the selection will be based on online written test and interview. The deputy general manager will be selected through short listing and personal interview. Candidates will be shortlisted on the basis of their qualification, experience and overall suitability for interview. The qualifying marks in interviews will be decided by the SBI. The merit list will be prepared in descending order on the basis of scores obtained by candidates in the interview. The notification, CRPD/SCO-LAW/2017-18/08, can be viewed in careers’ section of the SBI’s website.